Today in Masonic History John Bigler passes away in 1871. John Bigler was an American Lawyer, politician and diplomat. Bigler was born in Pennsylvania in 1805. From a young age Bigler worked in the printing industry. In 1831 Bigler and his younger brother William moved to Bellefonte in Centre County. There John would buy the local paper Centre Democart. He would sell the paper 4 years later to begin studying law. In 1848 when news of the California Gold Rush hit the east coast Bigler headed west hoping to work as an attorney in California. Unfortunately when he arrived, in 1849, there was no work to be had and Bigler began working a series of odd jobs. That same year the first general elections were help in California and Bigler turned his eye to politics. Bigler won a seat in the California State Legislature and had a rapid rise to power. In 1850 Bigler, a Democrat, was elected by the heavy Democrat majority, to be Speaker of the Assembly and his name became well known throughout the state. In late 1950 Sacramento had a cholera epidemic and Bigler was not spared. Bigler stayed in the city helping physicians and undertakers with the overwhelming number of sick. In 1951 Bigler was nominated by Democrats as their candidate for Governor. Bigler would beat out his rival, a southerner representing the Whig part, by just over one thousand votes. The election still stands as the narrowest victory in California history for the office of Governor. Bigler was the third Governor of California, the first to complete a full term and the first to be reelected serving from 1852 to 1856. While in office Bigler was very opposed to Chinese immigration into the state. Bigler felt that Chinese immigrants would not be able to assimilate into American society. He passed several bills to levee taxes on Chinese immigrants working in the mines and established a fee for them entering the country. The latter was overruled as unconstitutional by the California Supreme Court. During his re-election bid in 1853 he was opposed by members of his own party who wanted to see slavery expand to California. That branch of the Democratic party called themselves Chivalry. Bigler and other Democrats patterned themselves on the Free Soil Party from New York, which was an abolitionist party. Despite threats by the Chivalry to split the vote in the state, Bigler won re-election. Up until Bigler's term there was no official state capital. Several locations were tried, Bigler kept steering things back to his adopted home town of Sacramento. 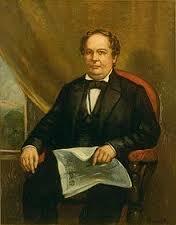 Finally in 1854 Bigler signed the law making Sacramento the capital of California. After leaving office James Buchanan, at the insisting of John's brother William then Governor of Pennsylvania, John Bigler was appointed U.S. Minister to Chile. Bigler appears to have been a member of three lodges, Pacific Lodge, Tehama Lodge No. 3 and Washington Lodge No. 20. The final lodge Washington Lodge No. 20 is located in Sacramento.